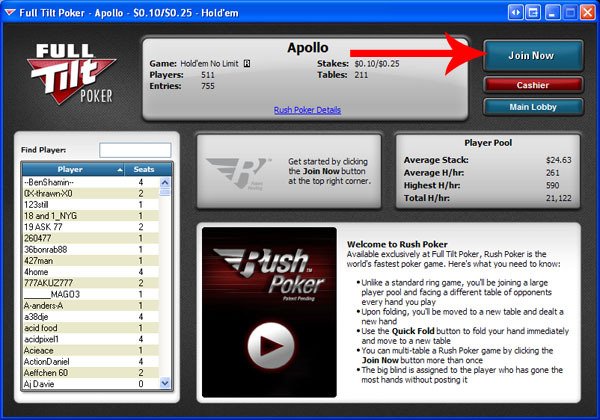 In early 2010, Full Tilt Poker launched Rush Poker, a variation on standard poker that can massively increase the number of hands played per hour for players of all types. 2 How Does Rush Poker Work? 3 Where Can I Play Rush Poker? 4 How Do I Play Rush Poker? 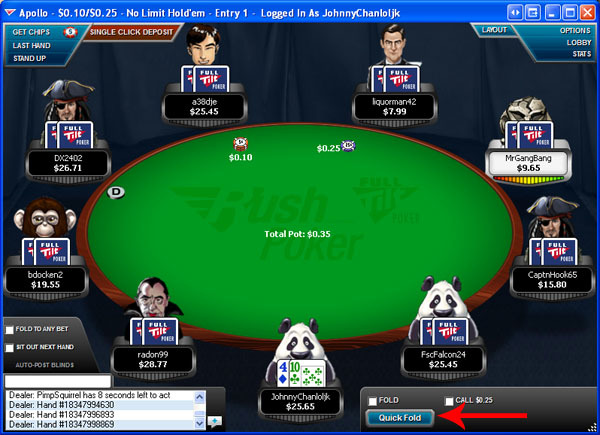 Rush Poker is the one of the most exciting and innovative additions to online poker in its short history. While it draws upon all of the basic tenants of poker, it changes up gameplay to such an extent that there can be some confusion about its qualities. FlopTurnRiver has developed a guide to ease you into the transition to Rush Poker, the most intense form of poker offered from Full Tilt Poker. How Does Rush Poker Work? The basic idea is this: whenever you fold your hand, you’re instantly transferred to an active table and redealt a hand. As a result, you are not stuck on a single table at a single position, but rather you are part of a larger pool of players that rotate among many tables. Once you press the ‘Fold’ button, you’re done with the hand! Player beware, you truly won’t have time to unclick fold if you made a mistake. Rush Poker is that fast! 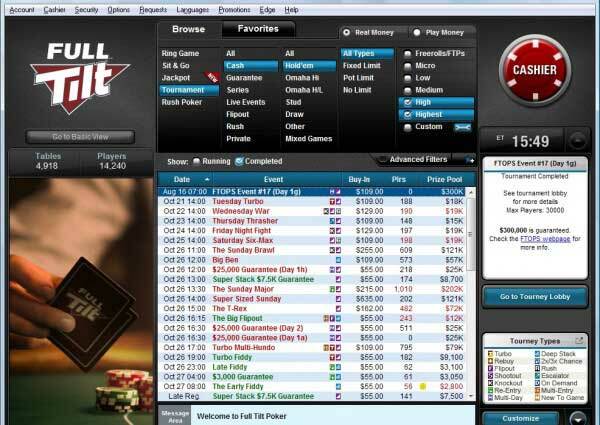 The Full Tilt Poker software is smooth and the player base is large, so Rush Poker is a fantastic experience for anyone who likes fast-paced gameplay with all the normal excitement of online poker. Where Can I Play Rush Poker? Rush Poker is available in the most popular cash game formats today, NLH (6-max and full ring), LE (6-max and full ring) and PLO (6-max only). 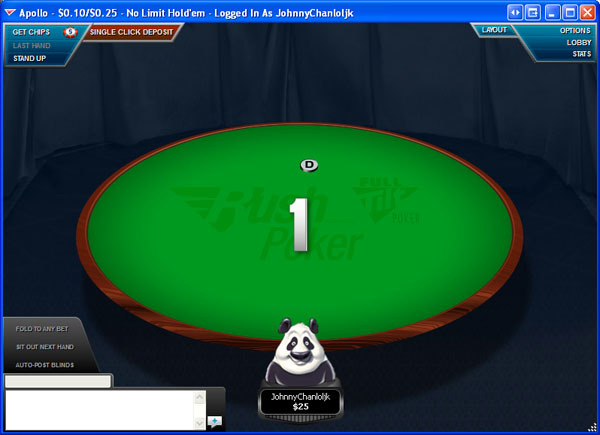 Hold’em runs from $.02/$.05 all the way to $2/$4, while PLO runs from $.05/$.10 to $1/$2. 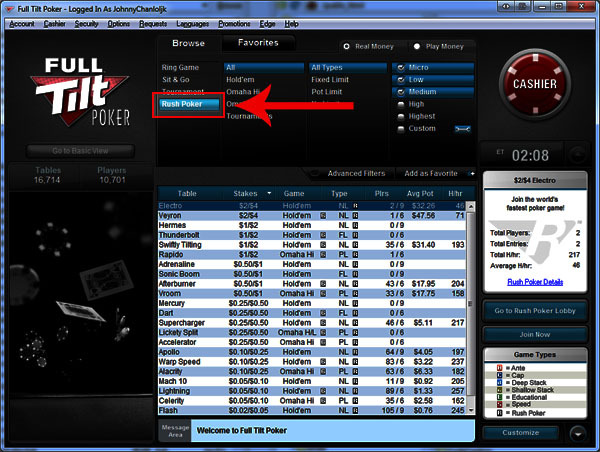 Rush Poker is also available for tournaments, so simply look for the ‘R’ Rush Poker label in the FTP tournaments section to have some fun. There are a few differences between Rush Poker tournaments and standard tournaments, including a lack of hand-for-hand play and less drastic table rearrangement near the bubble. Rush Poker is also available on mobile electronics for Android devices. How Do I Play Rush Poker? You are now immersed into the world that is Rush Poker! Notice the Quick Fold button (your best friend!). If you’re unhappy with your hand, then ditch it and you’ll get a new one almost immediately. It’s instant gratification and lots of action! Now you’re free to play as fast as you want, so take advantage! Once you’re used to it, you will be able to play thousands of hands an hour without dozens of tables. Rush Poker is the poker addicts dream! 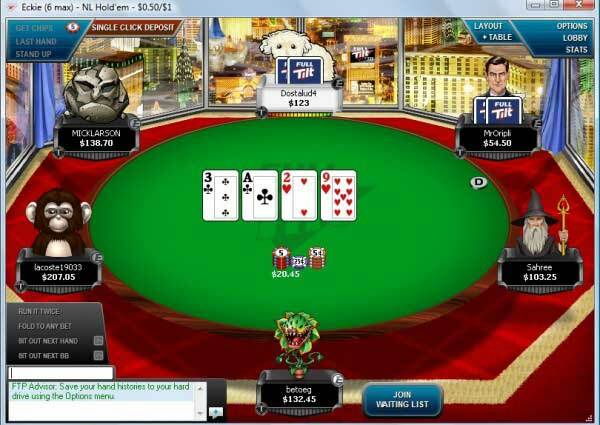 Players typically average over 200 hands/hour and Rush Poker allows for multitabling! Players can play up to 4 Rush Poker Tables per buy-in level and easily get 1,000 hands/hour without all of the clutter from playing tons of tables. There is no waitlist in Rush Poker; you can just dive right in! Because of the incredible pace, players can be more inclined to make simple mistakes that they might not otherwise make. Also, since you can play so many hands, people tend to only play really good hands! That means raises and 3bets are generally more serious then in other situations. You absolutely must focus all of your attention on the game, since everything moves so quickly. The player pools are large, but you’ll still encounter the same players frequently and must learn their styles and take notes on their gameplay. This can make the entire process difficult. Misclicks are common and, while you’ll cry the first time you accidentally fold Aces in the big blind, you’ll quickly get over it when you’re dealt them twice more that hour! Tight is Right: Everyone is playing tighter in Rush Poker, and generally speaking you should too! Rush is about maximizing your hands/hour, not pushing small margins on risky hands. The first 4 positions are almost always serious hands when they decide to play, so take notice. When someone raises you, they probably aren’t bluffing. Remember, generally speaking you need a better hand to call a raise than you would need to make the raise to begin with. Bluffing is less common. Unless you’ve played with a player a lot and have noticed strong bluffing tendencies, give them respect. Sure, you’ll get taken advantage of occasionally, but it will mostly save you money. Blinds aren’t that important. The blinds are always going to be unprofitable, just accept that. Save your money and fold your loose garbage in the blinds. Sure, the occasional 3-bet is going to be profitable, but don’t play the blinds looking to fight back. Rush Poker is very fast, and very exciting. It can also be a lucrative venture for a player looking to get in a ton of hands. The standard rules about smart poker play still apply, and you should not enter a Rush Poker game unless your mind and body are totally prepared to play thousands of hands. Mistakes compound quickly in Rush Poker, so pay attention to how you feel. Start slow and learn the ins and outs of the format, then ramp things up when you feel comfortable. Rush Poker is an incredible opportunity for skilled players to win lots of money, or for beginners to get a great amount of poker experience. – Your first three real money deposits count towards the maximum amount of $600. For example, if you deposit $100, then one week later deposit another $200, you will be earning a $300 bonus. – Clear the bonus by playing real money cash games or tournaments. Each point you collect is worth $.04 of the bonus. – Bonus is released in increments of 10% or $20, whichever is smaller. – The bonus must be earned in 120 days or any remaining balance becomes invalid. Those who are clearing their Full Tilt bonus should play Rush Poker. If you haven’t figured out why yet, Rush Poker allows you to play more hands in the same amount of time. The more hands you play, the faster your bonus clears. Let’s see how much faster. So as you can see, you would earn your bonus much faster playing Rush. And remember, you can even multi-table Rush Poker to increase your hands per hour even higher. Our Full Tilt bonus clearing page goes into even more details on how to earn your bonus.